In honor of the first day of spring, Dairy Queen wants to give you ice cream on the house! This sweet treat can't be beat! Dairy Queen once again proves why it rules the dairy dessert world with a promotion that is not to miss. This Wednesday, March 20, head over to your local DQ and get a free small vanilla cone to honor the first day of spring. There really is no better way to usher in warmer, sunny days of the season than to enter the cone zone. In fact, according to what DQ says is legit research, people are happier on Free Cone Day than they are on their own birthday. In addition, 61.6 percent would share a bite of their cone with their significant other, but only 23 percent would share the first bite (there are some much nicer people out there than yours truly). This freebie lasts all day long in participating Dairy Queen locations. It is limited to one cone per person and excludes mall locations. So, avoid that food court, and find your nearest store instead. To find a Dairy Queen location near you click here. If free cones aren't your style, you can check out all things minty this month at your local scoop shop. DQ is featuring the blizzard of the month, Mint Oreo, as well as a new Mint Shake at participating locations. And, The Queen has a few more tricks up its sleeve to treat its loyal customers in the next few weeks. 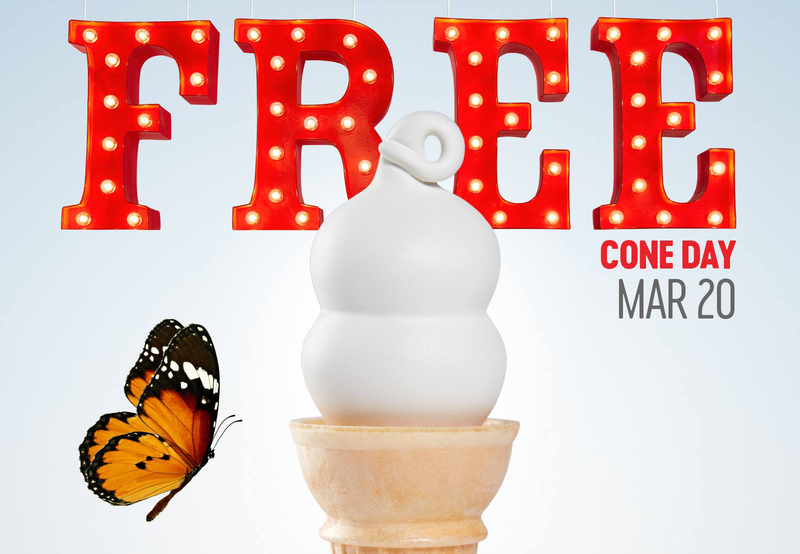 "Following Free Cone Day, DQ is offering a small regular or dipped soft serve cone for 50 cents, available for redemption only with the DQ mobile app, March 21-31 at participating DQ and DQ Grill & Chill locations. This offer includes the NEW DQ orange, creamy and crunchy dreamsicle dip, or try the DQ classic chocolate dip."